You don’t have to be a fish lover to enjoy this book, although it wouldn’t hurt. 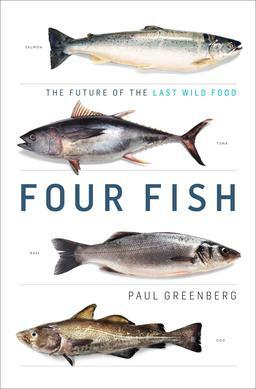 The four fish examined in author Paul Greenberg’s book are Salmon, Cod, Sea Bass, and Tuna. Why these four? They are the four fish most likely to end up on your dinner plate. The goal of the book is to educate the reader on the pros and cons of wild versus domesticated fish. The author explores every conceivable viewpoint: farmed fish, the intermingling of farmed and domesticated fish, overfishing, genetic modification, fishing subsidies, catch limitations, no catch zones, regulations, etc. I’m not a sushi lover, but I did try a spicy tuna roll after reading the section on tuna. I also found myself watching the show Wicked Tuna. My takeaway after reading the book is that if we don’t make some radical changes soon, we could find ourselves in a situation where the demand outstrips the supply. The author doesn’t just spell out the many problems associated with demand and supply, he offers a number of well thought out solutions. One solution that made a lot of sense to me was switching to a fish more suitable to domestication called a Kona Kampache. My concern is that many of the solutions the author suggests require government oversight. The problem I see is when you have governments and legislators who believe that regulations are bad or when the people who are responsible for the regulations don’t rely on science and fact when making their decisions. After finishing the book, I headed to a fancy seafood restaurant. I had the Ahi Tuna. My guest had the sea bass. Both were good. Both were expensive. No one has to worry about me consuming too much fish.